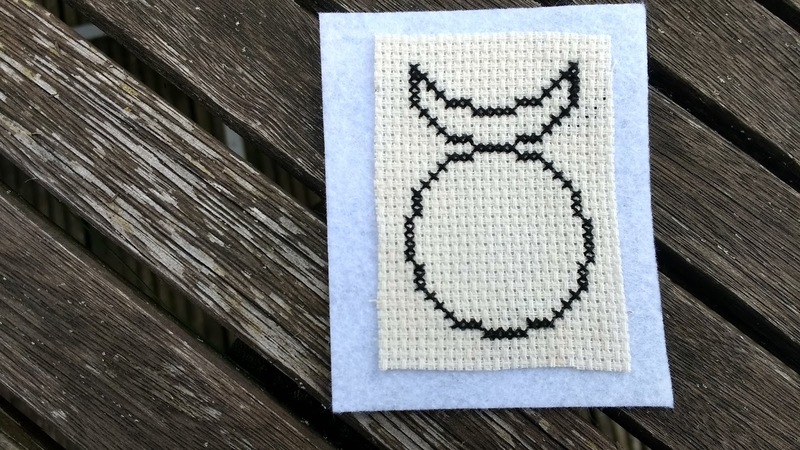 It is not easy to find embroidery related to pagan symbols. Even the patterns available are scarce and most of the time quite expensive. 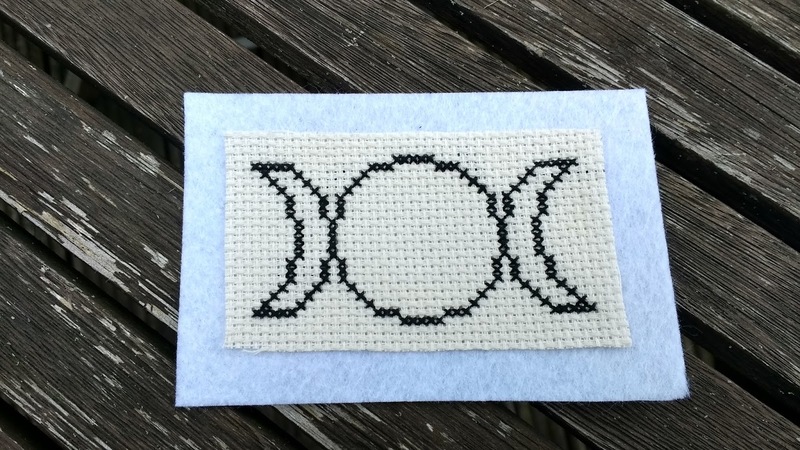 I found some freebies in pagan symbols and I decided to make them and, why no, sell them in my Etsy shop. For the moment they are only five but I will extend the collection and have so much more in the next weeks. I started for the most important symbols for any Pagan, the Horned God and the Triple Goddess. 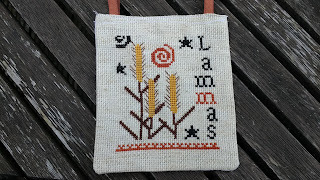 They are embroidered over Aida 14 count cream with black thread and mounted on white felt. 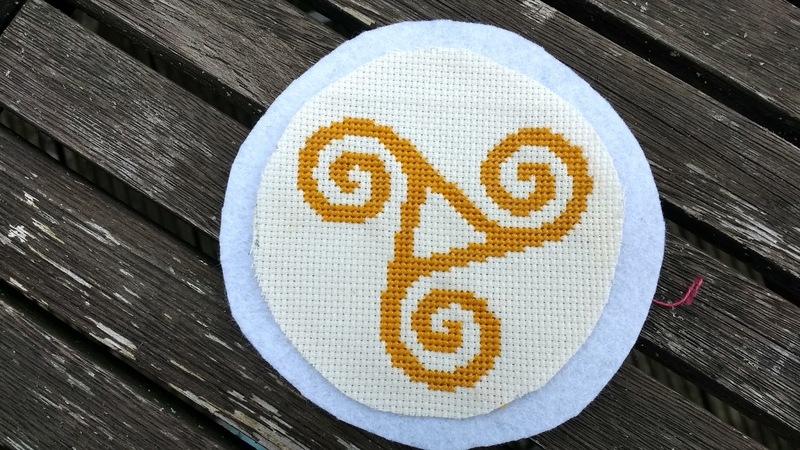 Another Triple Goddess symbol is the Goddess Spiral, which represents the Goddess in Her three aspects: Maiden, Mother and Crone. It is done in Aida 14 count with golden thread mounted on white felt. One I like too much is Hekate's Wheel or Hekate's Strophalos, which is a symbol specific of the goddess Hekate, Goddess of the darkness in Her Crone aspect related with the New Moon. 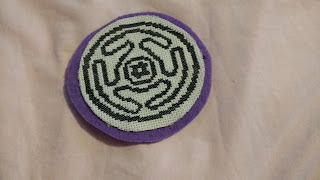 It is embroidered in one of Her colours, black, and mounted over purple felt. Finally, because we are in the dates around Lammas, I started a series of banner called Wheel of the Year Banners. I will prepare one for each one of the Sabbats. I decide to mount as a banner so you can hang it in the front of your Altar. 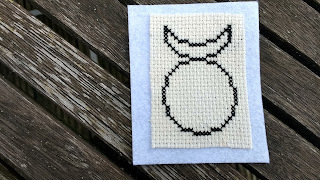 All of these embroideries can be order from my Etsy shop. They are completly customizable and will be made specially for you.